"What does the Scripture say?" 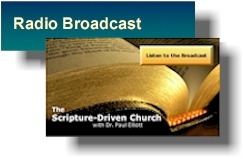 The Scripture-Driven Church broadcast airs on selected radio stations each week, and is also available 24 hours a day on the web. People in every U. S. state and over 55 countries tune in regularly. At the beginning of each broadcast, our announcer reminds listeners of the Biblical principles behind our message: "The church of Jesus Christ must be the Scripture-driven church. God's inspired, inerrant Word must be our sole authority, and our infallible critic, in every area of life and ministry." "Thanks to your messages over the past few weeks, I have today received our Lord Jesus as my Savior and repented in Christ." "I'm a truck driver, and I download your broadcasts and listen to them while on the road. The series on Colossians has been a real blessing." Click here to learn more about the broadcast.